Tradeoffs were made to get this phone to $349. After some thought, I probably would have made the same decisions if $349 was my target price. I hate carrier and manufacturer ‘improvements’ more than ever. Having a ‘pure Google‘ phone is liberating. This will likely be my main Android phone for the next the year. This won’t be a best seller, even if it should be because it is the best value phone we’ll see all year. The Nexus 5 comes in a typical Google cardboard box having come from the Play Store where it can be found for $349 for 16GB version and $399 for the 32GB version. That’s a $50 premium over the base model of last year’s Nexus 4, also made by LG, but the same price that was being charged for a 16GB version (the 8GB version was $299). But the Nexus 5 is a huge upgrade in almost every way. Taking it out of the box is a pretty typical experience…until you actually pick up the phone. If you are coming from a Nexus 4 like me, you’ll note how hollow the phone feels. Hardware-wise, it has improved in almost every way. But it is also significantly lighter. It reminds me of the jump from iPhone 4S to iPhone 5 or the iPad 4 to the iPad Air. The Nexus 5 has a much nicer 5-inch 1080p display compared to the smaller 4.7″ 720p display on the Nexus 4 while only being a rounding error larger. Weight? The Nexus 5 is 10 grams lighter than the Nexus 4 (130g vs. 140g). The weight loss is probably helped greatly by the loss of the glass back plate in favor of a rubberized plastic back. Glass looks pretty, especially with the Nexus 4 bedazzeling, but it is a weak spot and also has a low strength-to-weight ratio compared to aluminum or quality plastic like the 5 has. I cracked my Nexus 4 back plate near the camera which affected my shots from then after. In a form over function move, Google/LG has opted for a much larger glass lens than the camera actually needs, opening it up for easier damage and dirtying. Sticking with the camera, and indeed the biggest shortcoming of the device for a second, the quality of shooter here is not bad. I’ve taken some great pictures with it, and with Google Plus Photos on the back end doing an increasingly better job at turning mediocre photos into great photos, it is a good solution. But as David first noted, and we confirmed with testing, the Nexus 5 isn’t a top notch shooter. It can take some great shots if everything comes together nicely, and the HDR + is a nice addition, but it isn’t going to wow you like some other high end smartphones are starting to do. I found it to be sensitive to my hand movement more than other camera phones I’ve recently tried including flagships from Apple, Samsung and HTC. It also takes a second or two to register a picture, even after you hear the “shutter” sound – which is usually a signal that you can now move the camera. Not in this case – blurs happen. That doesn’t mean you can’t get a great picture. In fact, the Nexus 5 beat the iPhone 5s in more than a few of the images we compared in our ‘smackdown’. I understand Mr. Beren’s concern about the camera quality here, but for me it isn’t dealbreaker in nature. Plus Google has said, and it has a solid history of backing this up, that it will upgrade the camera quality via software in the coming weeks and months – so we know we are only dealing with baseline. You’ll note that the ‘big brother’ LG G2 has an extra hour on there thanks to the 3000Ah battery… this is a perfect example of cutting costs and cutting weight. Besides the camera and battery life (and frankly, I’m 100% fine with battery life), there is precious little to complain about. My other two quibbles are that I can’t use T-Mobile’s Wifi calling and the screen isn’t quite as bright and colorful as, again, the LG G2. Again, these are areas where LG has shown it can do better with the G2 on T-Mobile. There is so much to love about the Nexus 5. It isn’t just the weight but also the matte back cover that makes it feel great in the hand. Power and volume buttons are where you’d expect and what’s now become standard on Android phones on the sides (ahem G2’s weird middle back plate buttons and HTC’s top power button). They are ceramic and feel perfect. Speakers sound good and are now located on the bottom, a big improvement over the Nexus 4’s back muted speaker, but not quite as amazing as HTC One’s front facing blasters. The Micro-USB power plus is exactly where you’d expect it, but curiously it is backwards meaning that MicroUSB docks won’t work right. Charging can also be done via wireless charger which I haven’t experimented with yet (but I hear good things). We’ll get into Android 4.4 a little deeper in another post but as for now, on the top level EVERYTHING. IS. BETTER. With vanilla android you don’t get crapware or silly nonsensical overlays – and that by itself is almost worth the price of admission. But there are some notable software updates here. First off, the icons are bigger and look better (3rd party icons will need some pixel adjustment). Project Svelt is Google’s attempt to bring Kit Kat to bargain bin smartphones that top out at 512MB of RAM. We can’t really tell how that’s going yet but on the Quad 2.2GHz core Nexus 5, Kit Kat is super buttery fast. I feel like this is the type of speed increases Google was talking about when it released the Butter optimizer last year. Page flips are instant, Apps open super quick, there is almost no lag anywhere. Even swiping and keyboarding feels more accurate. Haptic response on key taps is excellent. Moving over to the largely similar LG G2, you immediately feel some lag on an otherwise speedy phone. 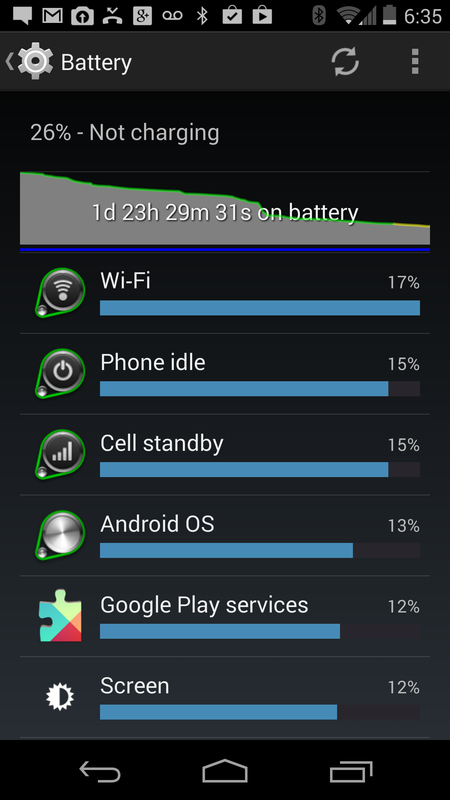 Is that because of the OS or LG/carrier software or Kit Kat? I’m not certain but since the hardware is almost identical, you know something is at play. There are a lot of other superficial improvements in Kit Kat including much more pleasing overlays and other GUI eye candy that looks and acts much nicer along with upgraded (slightly) photos and gallery apps. Previous app compatibility is also pretty complete. Only in Facebook did I have any crashes (and I’m not sure that they were any more than normal). Just get the Nexus 5. At Google. Sure it will cost more up front than a typical Android flagship product, but you’ll be able to make that money back in subsidy-less monthly payments in a matter of months. 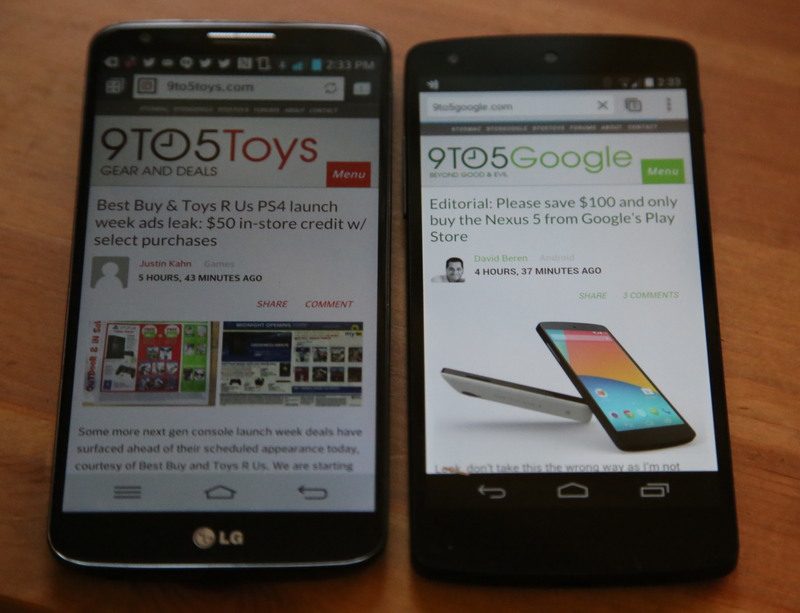 The LG G2 ( & Samsung S4, HTC One) is bigger better hardware. The camera is better/faster, the battery is bigger/lasts longer, its screen is slightly bigger/brighter and its better integrated into T-Mobile with Wifi calling and other carriers with pricing plans. But your experience is ALWAYS going to be better with a Nexus device overall and you’ll save a lot of time and money in the long run.